Welcome to the home of the Red Rock Raiders. We are a small, rural District located in Red Rock, Arizona, centered one hour from Phoenix and thirty minutes from Tucson, Arizona. You’ll find our town in the lower Santa Cruz River Valley, near Picacho Peak State Park. We serve students in Kindergarten through 8th grade. Our faculty and staff value each child as an individual, while helping students continually strive for their personal best. We hope you like our website. It contains a lot of helpful information, such as the school calendar, news and events going on in our school, and how to get in touch with us. We hope this site will answer any questions you may have about our district. If you are unable to find what you are looking for, please stop in and see us. We are here not only to provide a quality education for our students, but also to serve our community. We would love to see you. As we begin our third quarter of the 2018-2019 school year, I am proud to say that this year has been great! We want to extend a warm welcome to our new families who have moved into the Red Rock area. We continue to grow, and we enjoy seeing new faces on campus. We look forward to forging strong and lasting relationship with our parents and community. Together, we will strive to support our students. To our existing families, we appreciate your continued support. Ms. LeFager, our assistant principal/curriculum director, has conveyed her many years of experience and love for coaching teachers! She is a key part of our teacher professional development, supports, and guides our teachers with curriculum and curriculum mapping throughout the school year. She enhances our students academic success by doing assessments and providing targeted feedback to teachers. We are fortunate to have her! Parents are always welcome to participate and support students in their school experience. We believe parents, teachers, staff members, and the community are fundamental in the success of our students. We look forward to a strong finish to our 2018-2019 school year! The mission of Red Rock Elementary School District is to provide comprehensive, success-oriented instruction for all students in our growing district. We design learning opportunities to maximize each student’s potential in the areas of academic ability, social and emotional development, physical well-being, cultural and aesthetic awareness, and community contribution and responsibility. Red Rock School District will continue to pursue and implement scientifically research-based educational methods, strategies, and technologies. Red Rock Elementary School is a professional learning community that ensures each student learns and succeeds in all academic areas and realizes his/her full potential as a positive contributing member of society. The top priority for every school and the district as a whole is to accelerate the continuous improvement of teaching and learning to enable all students to meet high standards. Join us for our kindergarten round-up on Thursday, April 25 at 9:00 a.m.
Come join us, and make a difference in the life of a student! We have approved our school calendar for the next school year! 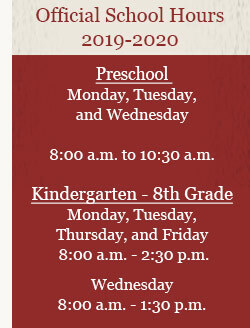 We invite you to view or download our 2019–2020 school calendar at your convenience. Red Rock DO is now on Facebook. Like us for updates and information about our district and schools. Stay up to date with all of our athletics activities here at Red Rock. Please take some time to visit our Athletics page for all the details.